Nacional Operta in Oslo, Operahuset, Snøetta 2008. Sketch by MADC. The drawing supposes probably the most valuable tool to see, not only to look, architecture. The cinematographic record of the eye, our vision in movement, our time, conceals often essential aspects from everything what surrounds us, folds of the visible thing only evident under certain conditions of attention and belonging to the place.1 The pleasure of drawing a face, a city or a landscape, slows down us and invites us to explore from the look, hurried since it walks before the lack of time, distracted by the cloud of images that slip as papers on the water of our retro-illuminated screens. A rapid note of the Opera of Oslo shows here alone the indispensable thing: a landscape of plegaduras, light and a soft surge.2 Nothing any more seems to be necessary, probably the opportune distance to understand what we see, this to take distance to try to come closer, actually. 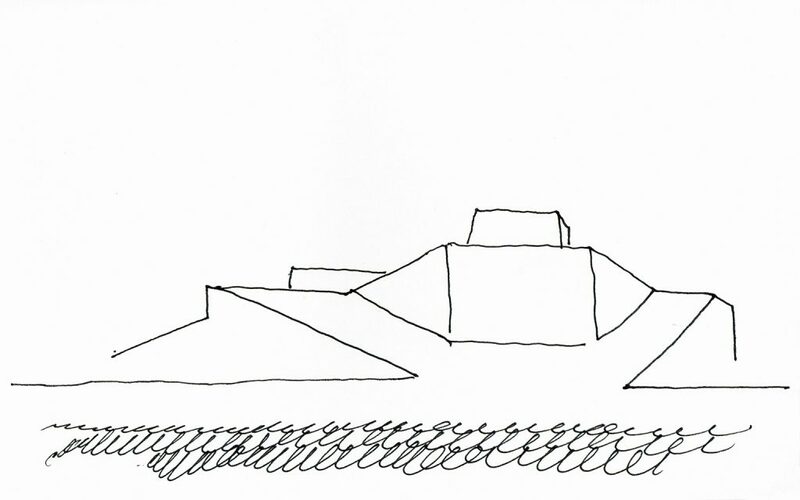 The drawing reveals his important questions since they are the perspective, here undecipherable; the scale, ingeniously manipulated; the proportion, horizontal as the eye of the crocodile; the geometry, of triangular base; the relation with the light, dazzling from an improper Mediterranean white; the soft sway of the water on the back of an iceberg precisely calculated. So importantly it turns out to be here the demonstrated as the finely removed and even, why not, manipulated: the drawing lies in occasions to tell the truth. The exercise of the drawing allows to touch the secret conditions of a place, to decipher the “life” of the forms beyond the circumstances that could interponerse.3 We need to draw to deal, to see from the belonging, to decipher the essential thing of that one that us appears in the battle of the body to body. Though also we need to draw to recognize we us same in this to pass, to feel included, sheltered, to belong somehow to this unknown world that we try to understand from the militancy of the drawing. We are the first fugitive of our notebook of trip. We are, fleetingly, inhabitants of the drawing. 1 In someone of his creations on video, Bill Viola slows down so much the speed of the stills that turns out to be really unbearable for some persons. To see “The quintet of the astonished” (The Passions), 2000. 2 National opera in Oslo, Operahuset, Snøetta 2008. Sketch by MADC. 3 Fernando Távora speaks on the life of the forms in “Sobre la organización del espacio“, Valencia, UPV, 2014 (Original text of 1964).